I’ve hesitated sharing these recipes, but I promised my peeps I would share, for several reasons. So here I go. Every party I prepare food for is always low carb and Keto. I take this life seriously! If I eat this way because I believe it is the healthiest for all people and not just people with type one diabetes. 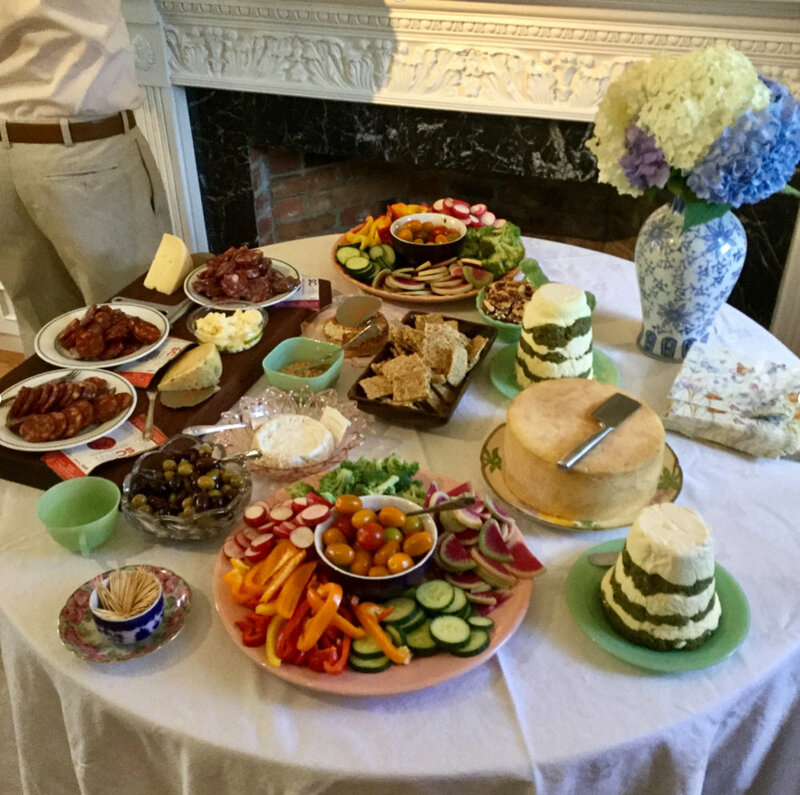 It has been reported that 80% of all people are blood sugar challenged, so welcome to low carb partying! 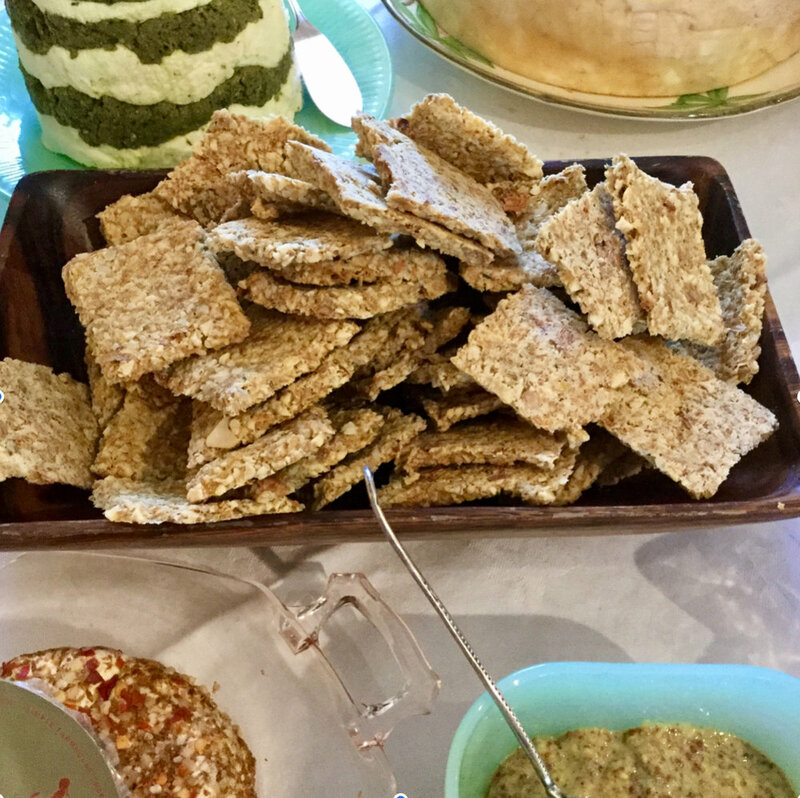 In this blog I will be sharing my Pesto Tower, my exclusive Rosemary Kimchi Crackers and Magic Hearts and Salted Almond Chocolates. While meditating the other day, I remembered where I first saw the Pesto Tower! I had Susan Branch’s Heart of the Home beautiful cookbook. Somehow I have lost it with the moves over the years, so it took me a while to remember. 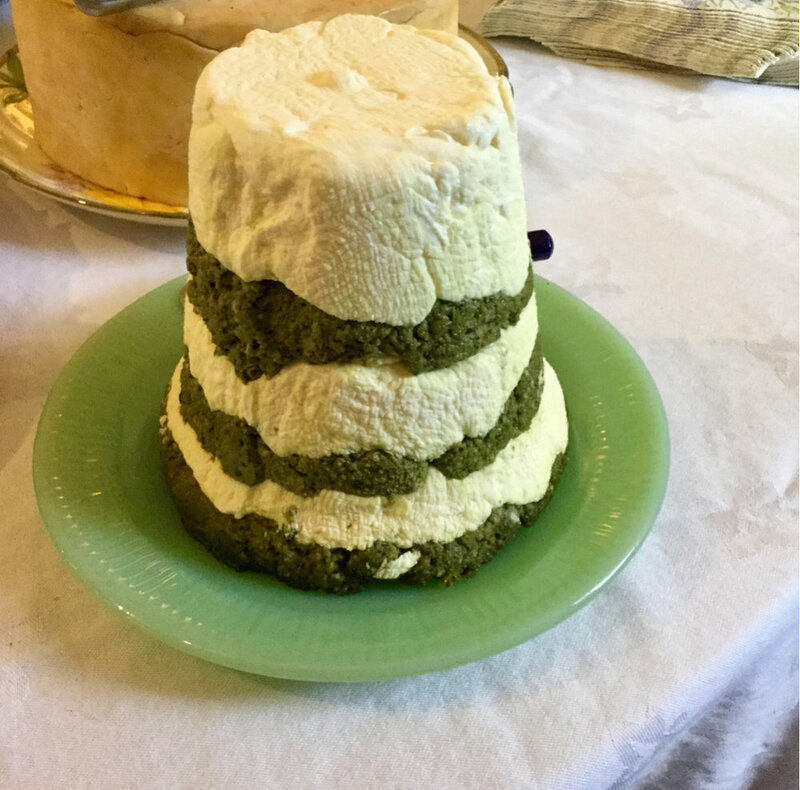 My recipe for pesto is very different, but I certainly want to give Susan Branch total credit for the idea for the tower and the genius production of how to mold it! The mold for the tower is a flower pot lined with damp cheese cloth. You make the cream cheese/ butter part and then make the pesto and then layer them. This recipe filled 2 flowerpots, about 8 inch high and 6 inches across. 1 lb of the best butter you can find, I get raw grass fed butter from a local farmer. Certainly if you can find that, it’s the best, but Kerry Gold is fine too. Cream these in your food processor until very smooth and creamy. Remember to leave these on the counter until they are softened. Clean and dry you food processor and then make the pesto. When I make pesto I have to eye ball it, because no bunch of basil is the same, but what ever you come up with will be delicious. 14.5 ounces hard cheese like Parmesan, cut up into half inch cubes and grind in food processor. Add 2 large bunches basil, wash and dry the basil on paper towels and pinch off leaves and add to food processor. 1teaspoon salt and black pepper to taste. Line the flower pots with your damp cheese cloth, start putting in the first layer of cream cheese/butter and smooth it with a spoon, then add a layer of pesto and smooth it with a spoon. Continue layering until you’ve filled the mold or molds. Cover with the ends of the cheese cloth and place in the fridge. I usually make this a day before the party so it has time to get firm. Serve with low carb crackers, or raw veggies. It will last indefinitely in the fridge. I’ve never done it but you could probably freeze the leftovers too! I have hesitated sharing this recipe for a long time. 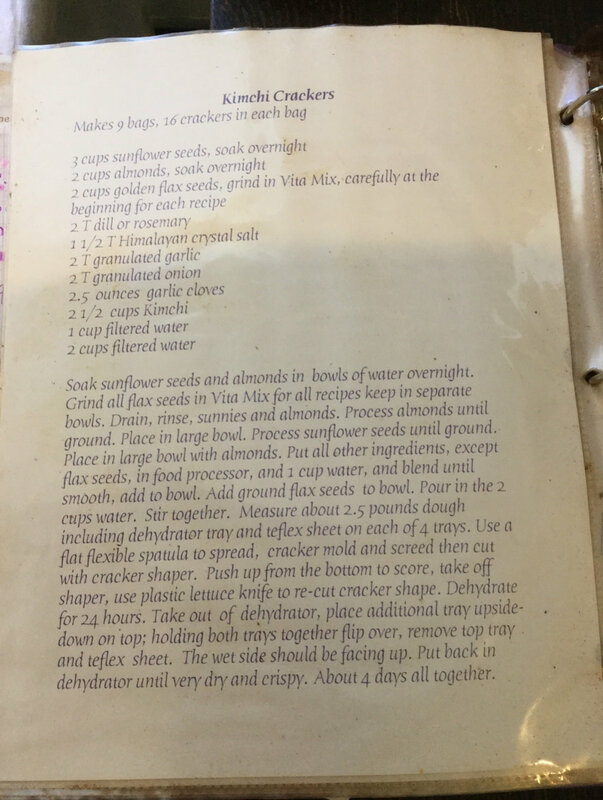 I invented this recipe when I was a raw vegan from 2003-2010 and built a Raw Food Snack company, called Aimee’s Livin’ Magic, around this and other recipes, like the chocolate recipes I’ve also decided to share. When my company closed in 2012, I had these amazing recipes that as it turned out, besides being raw, they were gluten free, grain free, sugar free and low carb. I was hoping to make a lot of money selling my recipes, but it’s 2018 and I’ve still got the recipes, so why not share them? 3 cups sunflower seeds, soaked overnight in a bowl of water, then rinsed and drained. Process already soaked almonds in a food processor and place in large bowl. Process already soaked sunflower seeds in food processor, dump in same bowl. Place all the other ingredients in food processor, except flax seeds, with 1 cup water. Process until well blended, and add to bowl. Add the ground flax seeds to bowl. Pour in the 2 cups of water. I use the Excalibur 9 tray dehydrator. Take 4 trays, line with 4 teflex sheets. Measure about 2.5 pounds on each tray, including the weight of the tray. Or divide into 4 equal amounts. Pat out dough until flat and about 10x10”. Use a rubber spatula and be sure they are evenly flat. Score in to cracker shapes. I get 36 crackers from each tray. Place each tray in the dehydrator, turn it on to highest temperature. When I was making these for raw foodists I used 125 degrees. But now I just use the highest temp, 165 degrees. Dehydrate for 24 hours. Then turn each tray by placing an empty tray on top, holding both then flipping, to take the teflex sheet off. Continue to dehydrate until crispy, probably 2 more days. Break the crackers up and place in air tight container. It has been estimated that each cracker is 1 gram carb. Enjoy with the best butter you can find, preferably from a local farm. Or the previous recipe of Pesto Tower. At every party I host I always serve stevia sweetened chocolate. Everyone loves it. When I had my company, I made 19 different recipes! Once you get the techniques and basic recipe down, you too can make different recipes and flavors using some of you favorite flavors or superfoods. Place cacao butter in large glass measuring cup placed in a pot of hot water, on low heat on the stove, until it is completely melted and measures 2 cups. Place all other ingredients in a bowl and stir. Then carefully add the cacao butter, stirring until all the powders are stirred smooth. Pour in molds, place on cutting boards and lay flat in your freezer. When set, pop out of molds and serve. I keep left overs in a bag in the freezer. You can use any chocolate mold you’d like. This beautiful and delicious chocolate was eaten so fast the last time I made it, I didn’t get a picture! Pour in an 8x8” silicon square mold. Distribute almonds evenly. Sprinkle with coarsely ground Himalayan salt. Place in freezer on a cutting board for support. When hardened, pop out of mold and break in pieces. 💜💜💜 these are the recipes for a Keto party. Add sliced hard sausage and sliced cheese, raw veggie sticks, and beverages. These recipes are near and dear to my heart. Treat them carefully.